Compressed sensing is a signal compression technique with very remarkable properties. Among them, maybe the most salient one is its ability of overcoming the Shannon–Nyquist sampling theorem. In other words, it is able to reconstruct a signal at less than 2Q samplings per second, where Q stands for the highest frequency content of the signal. 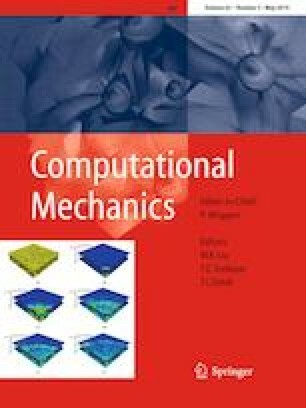 This property has, however, important applications in the field of computational mechanics, as we analyze in this paper. We consider a wide variety of applications, such as model order reduction, manifold learning, data-driven applications and nonlinear dimensionality reduction. Examples are provided for all of them that show the potentialities of compressed sensing in terms of CPU savings in the field of computational mechanics. This work has been supported by the Spanish Ministry of Economy and Competitiveness through Grants Numbers DPI2017-85139-C2-1-R and DPI2015-72365-EXP and by the Regional Government of Aragon and the European Social Fund, research group T24 17R. This project has also received funding from the European Union’s Horizon 2020 research and innovation programme under the Marie Sklodowska-Curie Grant Agreement No. 675919.